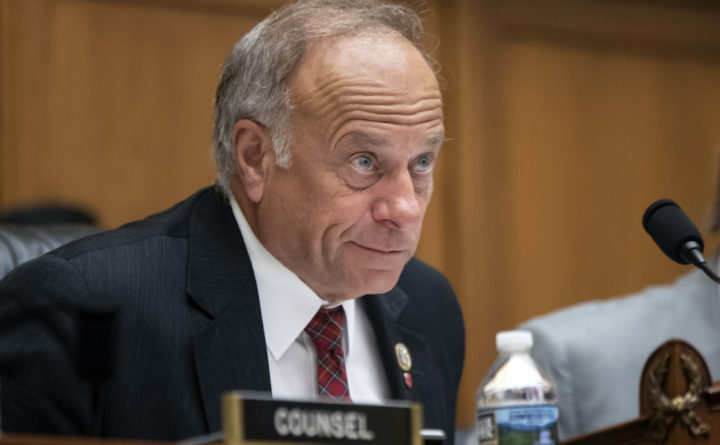 U.S. Rep. Steve King, R-Iowa, listens during a hearing on Capitol Hill in Washington, June 8, 2018. The House of Representatives has overwhelmingly voted for a resolution of disapproval aimed at Representative Steve King of Iowa. All of his fellow Republicans supported the action — he even voted for it himself, to show his remorse — and earlier this week, the party’s leaders stripped King of his committee assignments. Several GOP members are telling him to resign. The immediate cause of the rebukes is comments he made to the New York Times in which he seemed to suggest that “white supremacy” should not be considered offensive. In a statement a week following the original Times report, King denied that he meant this. But just a few months ago, he disputed remarks that were quoted accurately when they, too, were criticized for racism. That earlier controversy didn’t come out of a clear blue sky, either. In the New York Times, Trip Gabriel reports that while Republicans are now denouncing King, who has been in the House since 2003, he has “disparaged nonwhite groups for years.” Gabriel supplies a list of what the Times headline calls King’s “Racist Remarks and Divisive Actions.” But many items on that list, especially in the earlier years, don’t involve any disparaging of nonwhite groups. Like or dislike official-English laws, they are mainstream. As of 2014, 31 states had such laws. The federal government tests new citizens on English. The greatest-nation bill does not seem like the kind of thing a confident country should be doing. As with the official-English bill, though, one could support the effort without harboring any hostility to nonwhites. As the list gets closer in time to our day, the less defensible the items on it become. In 2018, King endorsed Faith Goldy, a fringe candidate for mayor of Toronto who defended the 14-word neo-Nazi credo on the radio. She won 3.4 percent of the vote. I draw three lessons from King’s evolution, or rather regression. The first is one that a lot of my fellow conservatives will find congenial: We need to distinguish between racial animosity and the devaluation of nonwhite lives, on the one hand, and advocacy of conservative views that may stir controversy but are not necessarily rooted in such sentiments. It is a distinction often lost on progressives committed to an expansive definition of racism. The second, though, is that conservatives themselves need to be better at policing that distinction. Too often conservatives react to unjustified charges of racism by discounting all such charges. Conservatives ought to be realistic, too, about the unsavory supporters that even defensible causes can draw. The third is that the frequency and offensiveness of King’s provocations have grown as Donald Trump has become the dominant force in the Republican Party. That is probably not a coincidence. During his presidential campaign, Trump barely and belatedly disavowed the white nationalist David Duke, attacked a judge for having Mexican ancestry, and urged the banning of all adherents of a global faith. And he won. Maybe King felt liberated by his example to be less politic about his views. Maybe his views even shifted, as his perception of what was normal and popular changed. If so, his judgment turned out to be wrong. During the general election, Trump benefited from having an alternative, Hillary Clinton, who was unacceptable to nearly all of the Republicans who objected to some of his behavior. Since then he has benefited from being the president and the leader of the Republican Party. King lacks such shields. And that’s why, even with Trump in the White House, he is scrambling to salvage his career.